Working with MSU neurologists and psychiatrists, a version of Brain Powered Games has been customized for the African context. After piloted and early version of the game as a Computerized cognitive rehabilitation therapy (CCRT) in Malawi with children with cerebral malaria, a new version of the cognitive games were built and tested in Uganda with HIV inflected children. The game was created for the iPad, Windows, and Mac. The game has been shown to provide a valuable tool to address both Malaria and HIV-associated neurocognitive deficits in adolescences in sub-Saharan Africa. We are actively exploring additional funding avenues to continue this work. Brain Powered Games Africa has been exhibited, presented about, and is the subject of scholarly research publications. This builds on previous work on Brain Powered Games (pre-Africa). Winn, B., Novak., B., Boivin, M., Giordani, B. Brain Powered Games – Africa. Exhibited at the International Academic Conference on Meaningful Play, October 2014, East Lansing, MI. Giordani, B., Novak, B., Sikorskii, A., Bangirana, P., Nakasujja, N., Winn, B., Boivin, M. (2015). 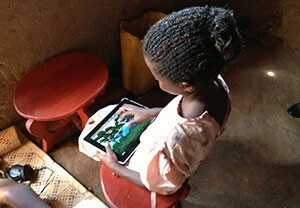 Designing and evaluating Brain Powered Games for cognitive training and rehabilitation in at-risk African children. Global Mental Health, vol. 2, January, 2015. Boivin, M., Winn, B. Computers and Cognitive Function. July 21, 2014. Talk at the University of Cape Town. Cape Town, South Africa.